NEW YORK - A fleet-footed pooch is lucky to be alive after racing a commuter train in New York City. The New York Post reports that the dog ran alongside the Metro-North Railroad train on a parallel track Tuesday. Engineer Joseph Delia said the dog was running "like she didn't have a care in the world." Then she got ahead of the train. Delia said he had to go "real slow" to avoid hitting her. 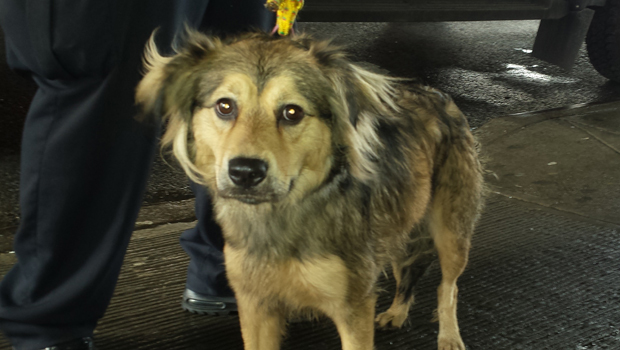 The dog started its journey at a rail yard on 149th Street in the Bronx and chased the train about a mile and a half to the 125th Street station in Harlem, where MTA officers Luis Alvarez and Errold Borges rescued her from the tracks. "We whistled, called and it actually came to us," Alvarez said, according to CBS New York. "It was actually very happy to see somebody because remember, it came from the Bronx." Passengers cheered at the happy ending. "There was a lot of commuters and they were actually clapping and very glad," Alvarez said. "There must've been a lot of animal lovers out there, like myself." The officers named the dog "Tie" after all the railroad ties she crossed. Tie is being cared for at New York City's Animal Care and Control. "We don't really know who she is or what she is because she had no tags around her neck, she had no license, and she has no microchip," Executive Director Risa Weinstock said. "She definitely has an owner out there somewhere, so we're really hopeful that with all this attention her owner will come forward." She will be put up for adoption if her owners do not come forward by Friday afternoon.